Dr. Budd received his BS in physics (1971) and BS in mathematics (1971) from Penn State University, and his MS in mathematics (1972) and PhD in high-energy physics (1983) from the University of Illinois at Urbana-Champaign. He was appointed as a Research Associate at the University of Rochester from 1983 to 1987, and was promoted to Senior Research Associate Professor in 1987. Dr. Budd was appointed as Senior Laboratory Engineer and Senior Scientist in 2003. Dr. Budd's research interest is in the field of experimental high-energy physics. His work has focused on the physics of W's and Z's and Dileptons, where he has been active in the CDF and CMS collaborations, and in neutrino physics, where he has been active in the CCFR/NuTeV and MINERvA projects. 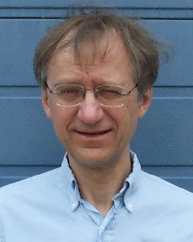 In instrumentation, Dr. Budd's work has been in the area of of scintillating tile/optical-fiber hadron calorimeters. Dr. Budd collaborates with the group of Professor Bodek and with Senior Scientists Sakumoto and de Barbaro.